The Minister for Defence, the Hon Christopher Pyne MP, and the Minister for Defence Industry, the Hon Steven Ciobo MP, today congratulated Victorian based company, RUAG Australia on delivering its 35,000th component part for the global F-35 Program. Minister Pyne said this achievement signified the strength of Australian defence industry’s involvement in the global F-35 Program. “RUAG Australia is the sole global source of the F-35 Program uplock actuator system and, in achieving this milestone, has confirmed its precision manufacturing and process solutions capabilities,” Minister Pyne said. The Minister for Defence Industry, the Hon Steven Ciobo MP, said this milestone was yet another example of Australian defence industry’s outstanding performance in the global F-35 Program. 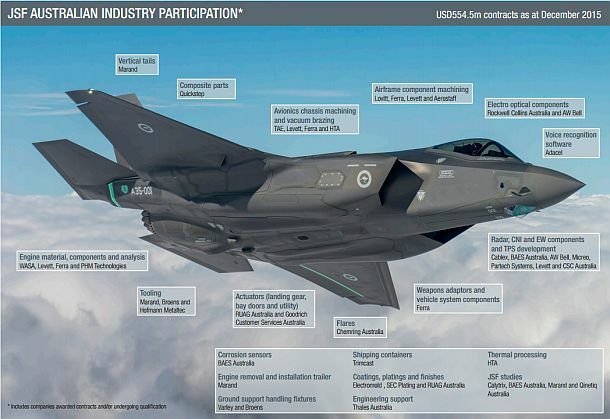 “Australian industry has reached more than AU$1.3 billion in production contracts as part of the global F-35 Program,” Minister Ciobo said. 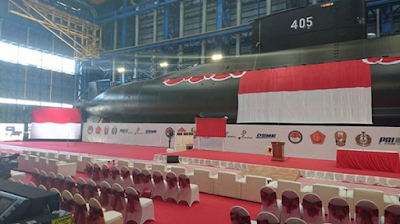 The launch of Indonesia’s third Nagapasa (Type 209/1400)-class diesel-electric submarine (SSK) has been delayed, but shipyard officials have devised a workaround to ensure that the vessel will take to the water in the coming weeks. An industry source who informed Jane’s of the situation has attributed these delays to heavy silting in waters off the Madura Strait, and the Surabaya Western Shipping Route, which is referred to in local navigation maps as the Alur Pelayaran Barat Surabaya (APBS). “The silting situation was aggravated in recent years by construction work at the Terminal Teluk Lamong,” said the source, in reference to the newly constructed terminal port at Surabaya. “Sediments from the construction have drifted towards the entire Tanjung Perak area, including the PT PAL dock where Alugoro was supposed to be launched. Now the waters are too shallow to safely launch the vessel,” he added. Alugoro is the third-in-series overall for the Nagapasa class, but the first to be assembled locally at PT PAL’s facilities in Surabaya. Its assembly was done in collaboration with engineers from South Korea’s Daewoo Shipbuilding and Marine Engineering (DSME) as part of a technology transfer programme. 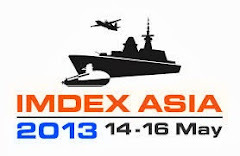 The boat is part of a KRW1.3 trillion (USD1.2 billion) contract signed between DSME and the Indonesian government in December 2011 for three SSKs. The vessel has an overall length of 61.2 m, an overall beam of 6.25 m, and a hull draught of 5.5 m.
Boeing and Australia's Department of Defence (DoD) are to partner in developing a concept demonstrator for a large unmanned aircraft system (UAS) that will support and protect air combat missions. 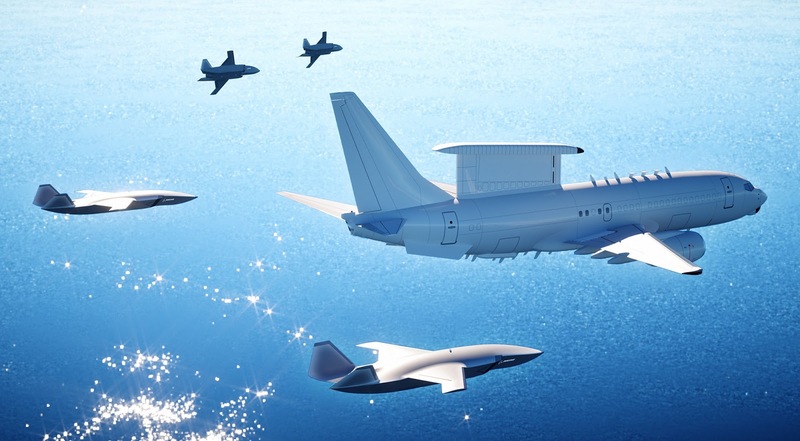 Called the Boeing Airpower Teaming System (BATS) but informally dubbed the 'Loyal Wingman', the system will complement and extend airborne missions through smart teaming with existing military aircraft and is intended for export. 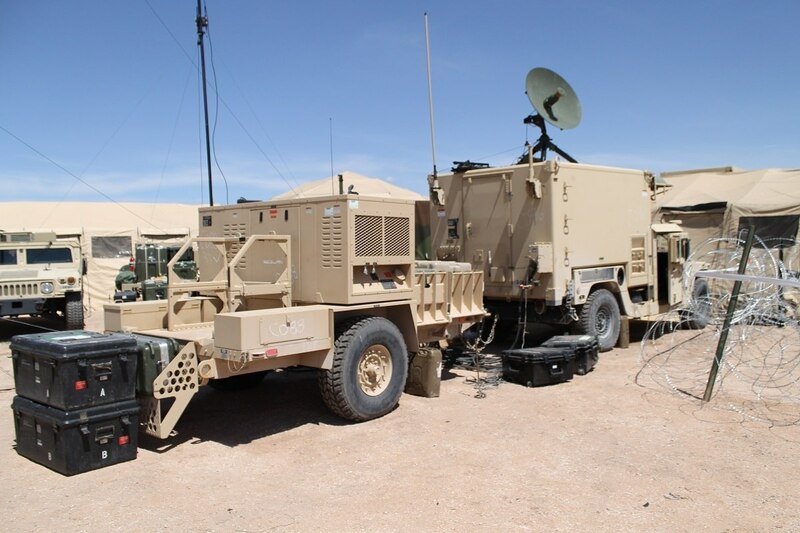 The DoD is investing AUD40 million (USD29 million) in the development. Boeing said the system represents the company's largest investment in an unmanned aircraft programme outside the US, but did not disclose the amount involved. Unveiling a full-scale model of the system on 27 February at the Avalon Airshow near Melbourne, Australian defence minister Christopher Pyne said the programme had "enormous" export potential. Should the system enter Australian service, it would be used to shield the Royal Australian Air Force's (RAAF's) manned aircraft, such as the Lockheed Martin F-35A Lightning II Joint Strike Fighters and Boeing E-7A Wedgetail early warning and control (AEW&C) aircraft. Dr Shane Arnott, director of Boeing's Phantom Works International, said system development had been under way for some time, but declined to say for how long. The first flight will take place in Australia and is scheduled for 2020. The model unveiled at Avalon was representative of the intended flight vehicle, he said. Although the platform would be powered by a single light commercial jet engine to save costs, "it will need to take off from the same runways and run the same speeds" as the aircraft with which it was teamed. The system is not remotely piloted but will be semi-autonomous and controlled from both the ground and the air, he explained. "The intention is the teaming system will be an extension of the air power assets that it will be supporting," Arnott explained. 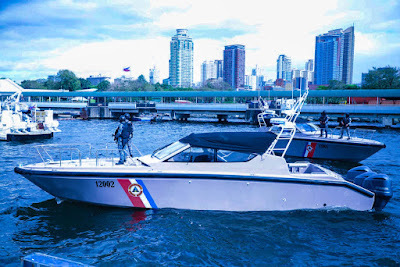 The government of Japan, through its embassy in Manila, turned over today two 12-meter high-speed boats to the Philippine Coast Guard (PCG). 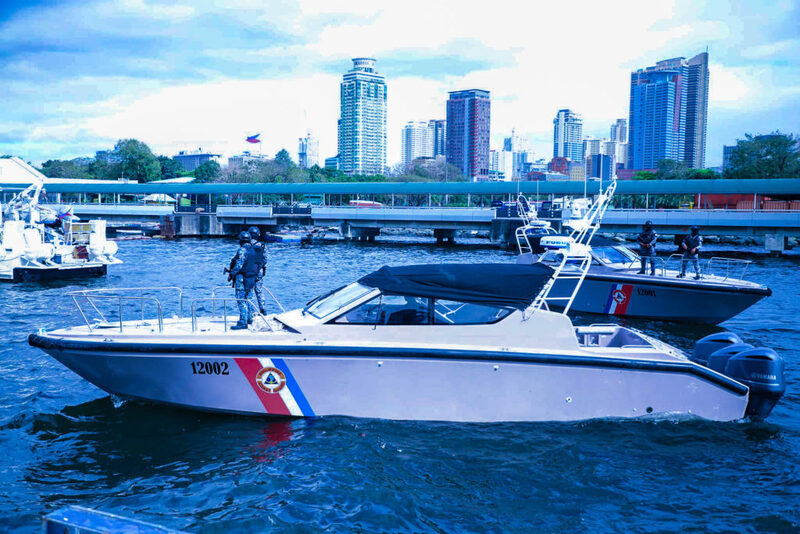 The high-speed boats were turned over by Japanese Ambassador Koji Haneda to PCG during a ceremony at PCG National Headquarters in the presence of PCG chief Admiral Elson E. Hermogino. “These speed boats will scour the southern part of the country for anti-piracy and counter-terrorism. With the alarming discovery of “floating cocaine”, these assets will also be utilized for anti-drugs operation,” PCG said. According to PCG, the speed boats which arrived January 4 has a maximum speed of 50 nautical miles per hour and can carry eight personnel. Admiral Hermogino expressed his gratitude to the Japan government for granting the request of President Duterte to include the speed boats in the anti-terrorism package under the Japan’s Grant Aid for Social and Economic Development Program for the country. 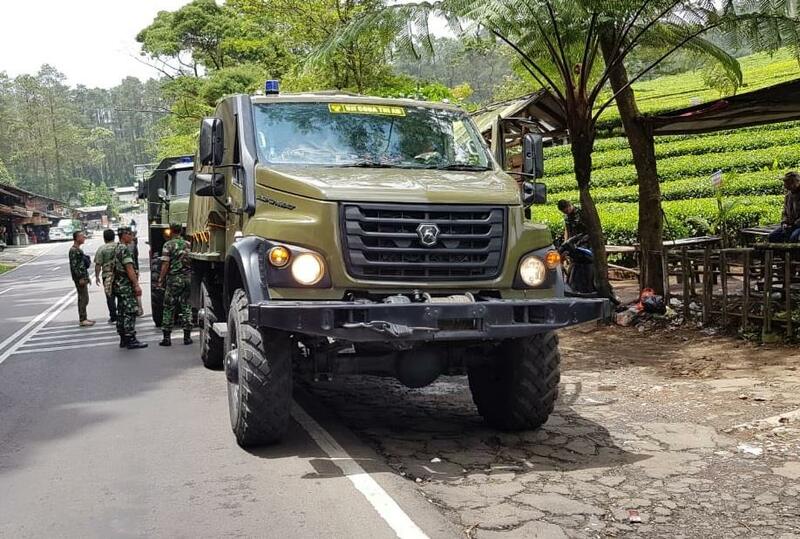 Kabaglaikmatpal Subdislaik Dislaikad Letkol Cpl Sulaeman Sabana mengikuti ujicoba Rantis buatan Rusia, Sako Next 4x4 dan Ural 6x6 Kontrak Pengadaan TNI AD dari PT. Rajawali Lintas Kreasi yang diselenggarakan oleh Dislitbangad selaku pelaksana kegiatan selama 2 minggu di Laboratorium Dislitbangad Batujajar – Bandung, Jum’at (15/2/2019). Uji daya jelajah lintas Pulau Jawa dimulai 18 Februari meliputi uji daya tahan tanjakan dengan kemiringan 15 s.d 30% di daerah Subang, dilanjutkan dengan uji kecepatan aman dan percepatan/perlambatan di ruas Tol Cipali menuju daerah Semarang. Keesokan harinya 19 Februari, uji daya jelajah dilanjutkan dengan rute tol Semarang – Kediri, Ngantang Batu dan Karangploso Malang Jawa Timur sesuai dengan parameter uji. Diharapkan Tim Uji dapat beristirahat di Pusdikarhanud Karangploso Malang Jawa Timur. 20 Februari 2019, uji daya jelajah lintas Pulau Jawa dilanjutkan dengan uji beban tarik Meriam 10 ton untuk Rantis Ural 6x6 dan 5 ton untuk Rantis Sako Next 4x4 di Pusdikarhanus Karangploso Malang Jawa Timur. Kemudian diikuti dengan uji daya jelajah lanjutan dengan rute Malang – Trenggalek. Sampai di daerah Trenggalek akan dilakukan uji over steering terhadap kedua jenis Rantis, dilanjutkan dengan uji beban panas dengan rute Trenggalek – Probolinggo. Uji coba Litbang kedua Rantis 21 Februari dilanjutkan dengan daya jelajah Probolinggo – Ponorogo – Sarangan Magetan. Setibanya di Sarangan akan dilakukan beberapa uji meliputi uji kemampuan menanjak sampai 45% dan 60% dengan beban masing-masing 5 ton untuk Rantis Ural 6x6 dan 2,5 ton untuk Rantis Sako Next 4x4; uji hand break pada tanjakan 60% dengan beban dan uji kekenyalan. Setelah kegiatan uji, daya jelajah dilanjutkan dari Sarangan Magetan menuju Jogjakarta. 22 Februari, uji coba daya jelajah dilanjutkan dari Jogjakarta menuju Ambal Kebumen, dan bersamaan dengan uji kecepatan rendah sejauh 10 km. Di Pantai Lebak Bulus Pesantren Ambal, Kebumen Jawa Tengah kegiatan dilanjutkan dengan uji lintas pasir terurai; uji lintas medan bersemak; uji lintas air dan uji lampu tempur. 23 sd. 25 Februari, uji daya jelajah lanjutan dimulai dari Kebumen Jawa Tengah menuju Tasikmalaya Jawa Barat. Setibanya di Tasikmalaya dilanjutkan dengan uji endurance selama 3x24 jam, dengan rute Tasikmalaya – Ciamis – Majalengka -Semedang dan kembali ke Tasikmalaya (terus menerus selama 3x24 jam). Uji coba Litbang Rantis ini akan berakhir hingga 28 Februari 2019, di Laboratorium Dislitbangad Batujajar Bandung. TSAMTO - Thailand’s defense budget for fiscal 2019 was approved at 227 billion baht (7.23 billion dollars), which is estimated at about 1.4% of gross domestic product. According to SCMP.com, thus, despite the criticism of the opposition, the state managed to achieve approximately comparable defense spending with its neighbors. So, on February 18, Singapore announced military spending for FY2019. in the amount of 11.4 billion dollars (3.4% of GDP.). At the same time, the increase in expenses amounted to 4.7% compared with the previous financial year. Indonesian authorities expect Jakarta’s defense spending to increase by 20% by 2024, or to $ 9.9 billion from the current $ 7.2 billion. 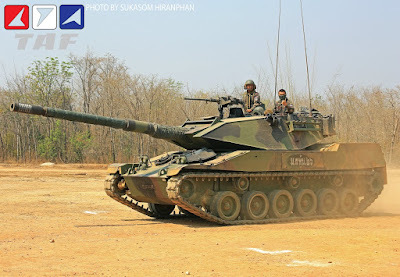 According to the TSAMTO database, the bill on military expenditures in Fy 2014, which was put to vote by the National Legislative Assembly of Thailand. amounted to 5.660 billion dollars, in 2015 - 5.655 billion dollars, in 2016 - 5.820 billion dollars, in 2017 - 6.160 billion dollars, in 2018 f. - 6.500 billion dollars. In relation to the gross domestic product, the defense budget practically did not grow and averaged 1.4% on average. 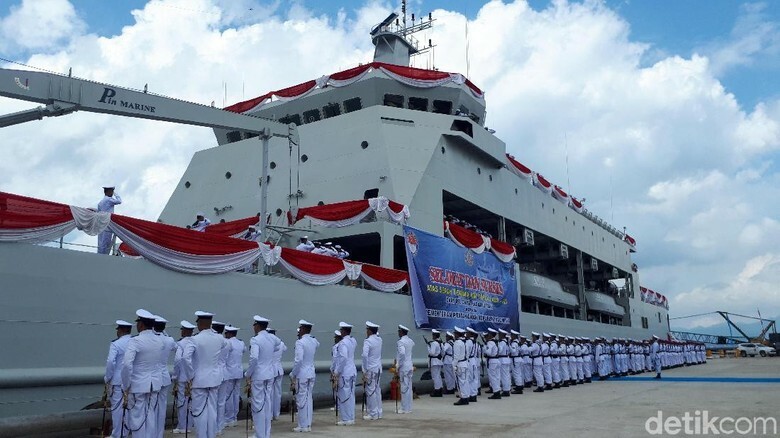 TRIBUNNEWS.COM, SURABAYA - PT PAL Indonesia bakal meluncurkan kapal selam yang dirakit di dalam negeri pada Maret 2019. "Alhamdulillah saat ini sudah kami siapkan proses dan prosedur protokoler untuk melakukan peluncuran kapal selam tersebut dan kemungkinan Maret 2019 akan kami luncurkan," kata Direktur Utama PT PAL Indonesia Budiman Saleh di Surabaya, Jawa Timur, Senin (25/2/2019). Kapal selam tersebut adalah pesanan ketiga TNI AL yang dipercayakan pembuatannya kepada PT PAL Indonesia sebagai perusahaan galangan badan usaha milik negara ( BUMN). 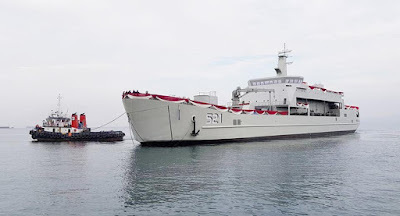 Dua kapal selam sebelumnya telah lebih dahulu diserahterimakan dengan dibuat gabungan PT PAL Indonesia bekerja sama dengan perusahaan galangan di Korea Selatan. Untuk kapal selam yang akan diluncurkan, perakitannya dilakukan secara mandiri oleh anak bangsa di galangan PT PAL Indonesia yang berlokasi di kawasan Tanjung Perak, Surabaya, setelah mendapat transfer teknologi dari Korea Selatan. Kepala Humas PT PAL Indonesia Bayu Witjaksono mengatakan, tiga kapal selam yang dipesan oleh TNI AL itu merupakan program pertama dari transfer teknologi antara PT PAL Indonesia dan Korea Selatan. Kapal selam pertama yang bernama KRI Nagapasa-403 telah diresmikan secara langsung oleh Menteri Pertahanan Ryamizard Ryacudu pada 2 Agustus 2017 dan saat ini telah memperkuat armada RI. Kapal selam kedua KRI Ardadedali 404 juga telah diresmikan di Galangan Daewoo, Korea. 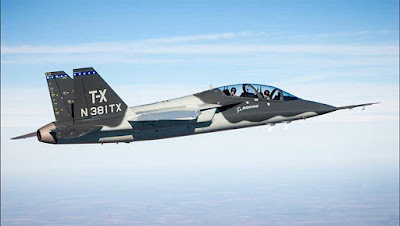 Boeing is in talks with the Royal Australian Air Force (RAAF) about a potential programme to supply the T-X advanced jet trainer the US corporation has developed with Saab, a Boeing executive said at the 2019 Avalon Airshow on 26 February. 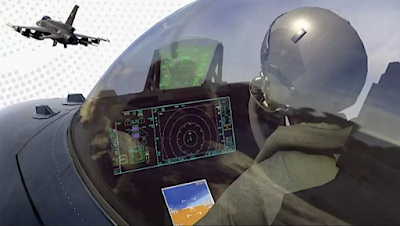 Thom Breckenridge, Boeing vice-president of International Sales, Strike Surveillance & Mobility, said in a media briefing that Boeing's preliminary discussions with the RAAF were aimed at gaining an understanding of the force's future pilot trainer requirements. However, he stressed that a programme has not yet been formalised with the RAAF and Boeing has not considered industrial plans to support any Australian T-X programme in the country. "We are very focused on discussions with the RAAF about T-X," said Breckenridge. "We are eager to understand the RAAF's needs and to talk with them about the benefits of T-X." He added, "There are no specific request for proposals in Australia yet, but we do understand that there is a requirement here and we will continue to have discussions with the RAAF about what their needs are and how we can help meet them." The RAAF's requirement for a new pilot system was outlined in the Australian government's 2016 Integrated Investment Program (IIP), a document that accompanied its defence white paper in the same year. The IIP included a programme to procure a 'lead-in fighter training system' with a timeline of 2022-23 and an approximate investment value of up to AUD5 billion (USD3.6 billion). The RAAF's pilot trainer requirements are currently met through a mix of Pilatus PC-21 and PC-9 aircraft and related systems and BAE Systems Hawk Mk 127s. Bandar Lampung - Menteri Pertahanan Ryamizard Ryacudu menyaksikan acara serah-terima KRI Teluk Lada-521 dari PT Daya Radar Utama (DRU) kepada Pusat Pengadaan Badan Sarana Pertahanan (Kapusada Baranahan) Kementerian Pertahanan di Dermaga PT DRU, Panjang, Bandar Lampung. 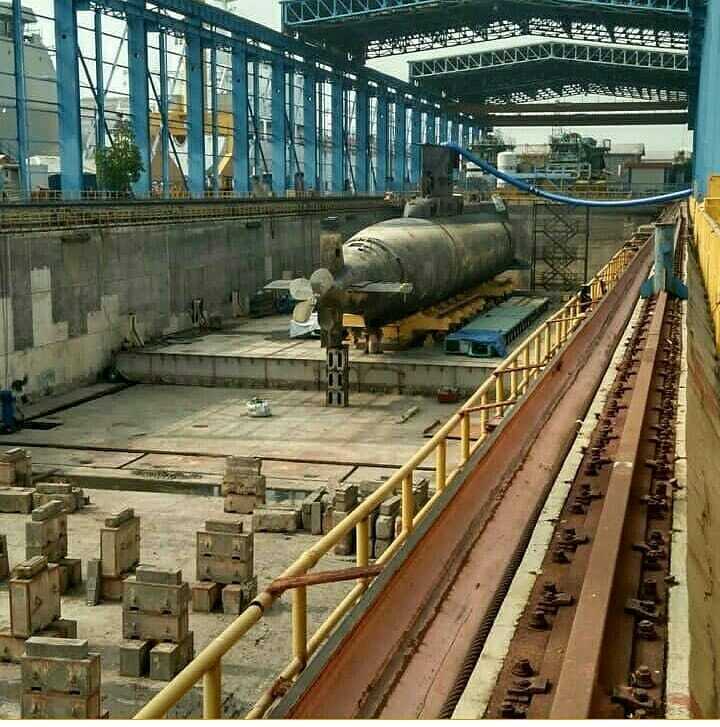 Kapal Angkut Tank (AT- 4) KRI Teluk Lada-521 itu akan memperkuat alutsista di jajaran TNI Angkatan Laut. Serah-terima KRI Teluk Lada-521 ini ditandai penandatanganan berita acara serah-terima dan pemberian replika KRI Teluk Lada-521 oleh Dirut PT DRU Amir Gunawan kepada Menteri Pertahanan Ryamizard Ryacudu. Ryamizard menyatakan penyerahan kapal angkut tank ini merupakan bagian dari upaya pemenuhan kebutuhan alutsista TNI untuk memperkuat pertahanan negara. 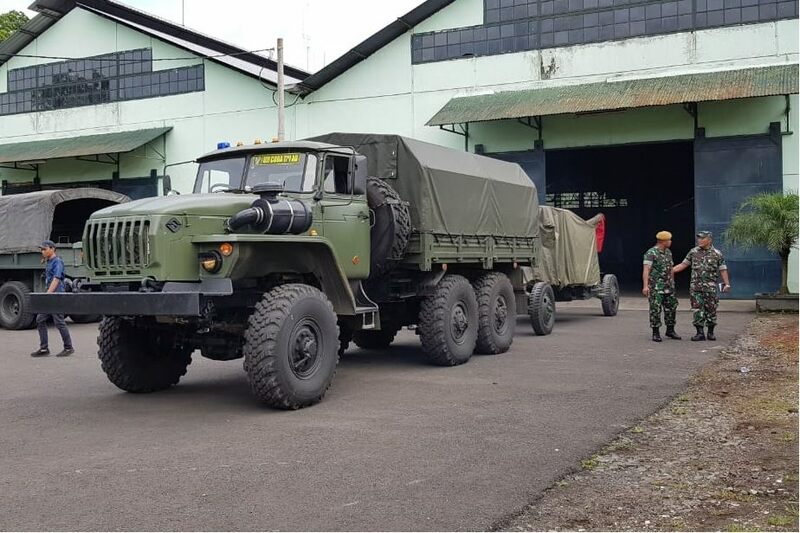 Selain itu, dikatakan Ryamizard, KRI Teluk Lada-521 merupakan alutsista dengan teknologi canggih. "Penyerahan kapal angkut tank ini merupakan bagian integral dari upaya pemenuhan kebutuhan alutsista TNI guna memperkuat pertahanan negara. Kapal ini juga merupakan alutsista modern berteknologi canggih, sehingga dapat memperkuat jajaran kemampuan TNI AL," ujar Ryamizrad kepada wartawan. Ryamizrad menambahkan, KRI Teluk Lada-521 merupakan Kapal Angkut Tank (AT-4) kedua yang dibangun oleh anak bangsa yaitu PT. Daya Radar Utama (DRU). Sebelumnya telah dibangun KRI Bintuni pada 2017. "KRI Teluk Lada-521 merupakan kapal angkut tank yang kedua yang dibangun di galangan PT Daya Radar Utama, di mana sebelumnya telah dibangun KRI Bintuni yang mampu mengangkut Tank Leopard yang telah diserahkan pada tahun 2017," kata dia. Seusai penandatanganan berita acara serah-terima, acara dilanjutkan dengan upacara peresmian dan pengukuhan Komandan Pertama KRI Teluk Lada. Komandan KRI Teluk Lada dikukuhkan kepada Letkol Laut (P) Gunawan Hutahuruk oleh Kepala Staf TNI Angkatan Laut, Laksamana TNI Siwi Sukma Adji. Acara dilanjutkan pemotongan pita oleh Ny Nora Ryamizard Ryacudu didampingi Ny Manik Siwi Sukma Adji sebagai simbolis resmi masuknya KRI Teluk Lada-521 di jajaran TNI AL. Kemudian acara dilanjutkan dengan tinjauan ke atas KRI Teluk Lada-521. Ryamizard juga berpesan kepada komandan dan prajurit KRI Teluk Lada-521 untuk meningkatkan profesionalisme serta menjamin keamanan dan kedaulatan laut Indonesia. Selain itu, ia meminta staf TNI AL merawat dan menjaga KRI Teluk Pala dengan baik. "Laksanakan tugas kalian di laut dengan sebaik-baiknya agar kehadiran kalian di laut mampu menjaga kedaulatan dan keamanan bangsa serta menjamin rasa aman dan nyaman bagi seluruh kapal yang berlayar di perairan Indonesia, baik kapal berbendera Indonesia maupun berbendera negara lain," lanjutnya. "Tidak lupa saya juga minta kepada Kepala Staf TNI AL beserta staf dan seluruh prajurit untuk merawat dan memelihara alutsista ini dengan sebaik-baiknya agar Kapal ini memiliki usia pakai yang optimal. Hal ini juga sebagai bentuk pertanggungjawaban kita kepada rakyat yang telah menghadiahkan kita Alutsista Modern yang berkemampuan dan berteknologi canggih ini," kata Ryamizard. KRI Teluk Lada-521 memiliki spesifikasi teknis dengan ukuran panjang 117 meter, lebar 16,40 meter, dan tinggi 7,8 meter. Kapal ini mampu melaju dengan kecepatan maksimal hingga 16 knots dan kecepatan jelajah 13 knot, radius pelayaran 6.240 mil laut (range 13 knot) dan mampu mengangkut pasukan serta ABK sebanyak 478 personel. 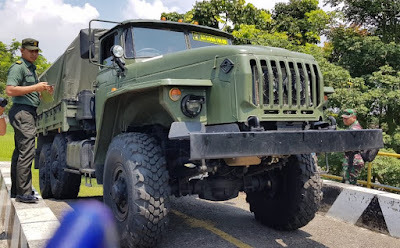 Kapal ini juga dirancang untuk mampu mengangkut sampai dengan 15 unit Tank BMP 3F serta 1 unit helikopter. 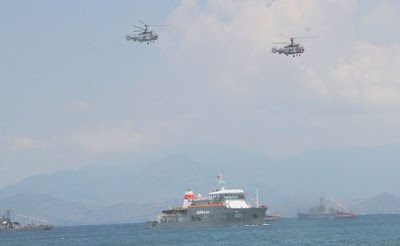 Dengan telah diserahterimakannya KRI Teluk Lada-521 itu, secara resmi hal itu akan menambah kekuatan alutsista di jajaran TNI AL, khususnya di bawah Komando Armada III yang beroperasi di perairan wilayah timur Republik Indonesia. General Atomics Aeronautical Systems Inc (GA-ASI) is expected to enhance its industrial engagement in Australia following Canberra’s announcement in November 2018 that it had selected the company’s MQ-9 Reaper to meet requirements under Project Air 7003 Phase 1 for an armed medium-altitude long-endurance (MALE) unmanned aerial vehicle (UAV). 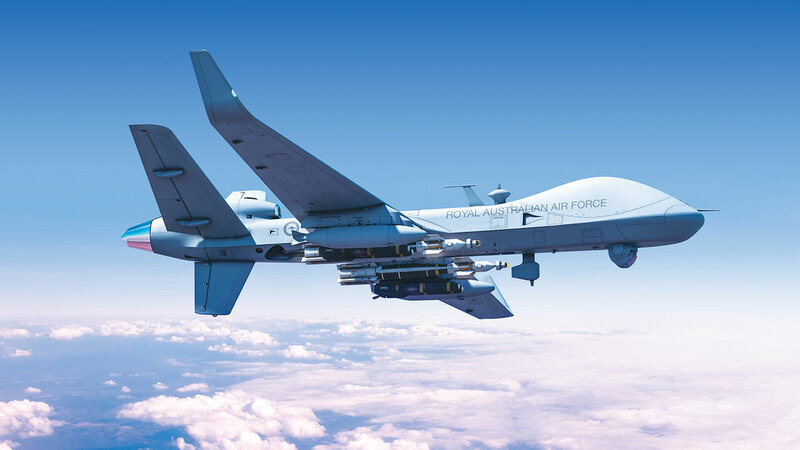 GA-ASI’s industrial strategy to support its Australian Reaper programme is built around a grouping of firms known collectively as Team Reaper Australia (TRA). 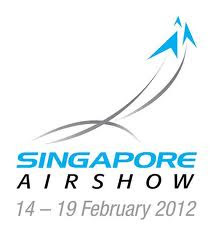 Warren Ludwig, director of international strategic development for Australia and Southeast Asia at GA-ASI, told Jane’s before the 2019 Avalon Airshow that it is likely that TRA will be “refined” as the programme matures. “TRA can be expected to be refined as the project further develops,” said Ludwig. 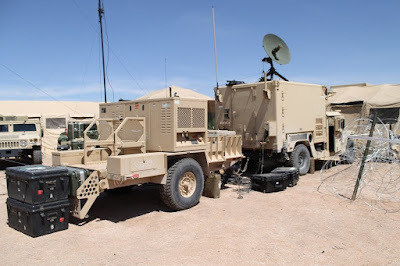 “GA-ASI is currently in discussion with a range of academic and research facilities to partner in areas including ISREW (intelligence, surveillance, reconnaissance, and electronic warfare).” The TRA was announced at the 2017 Avalon show and has since grown to encompass 10 companies, he said. “Discussions with [the Department of Defence – DoD] continue on the acquisition and support roles for these teammates,” said Ludwig. Ludwig also confirmed that the two Reaper variants under consideration by the DoD for the Royal Australian Air Force (RAAF’s) Project Air 7003 requirement include the MQ-9A, which is operated by the US Air Force (USAF) and the “newer and more capable” MQ-9B SkyGuardian platform, which has been ordered by the UK Royal Air Force (RAF). 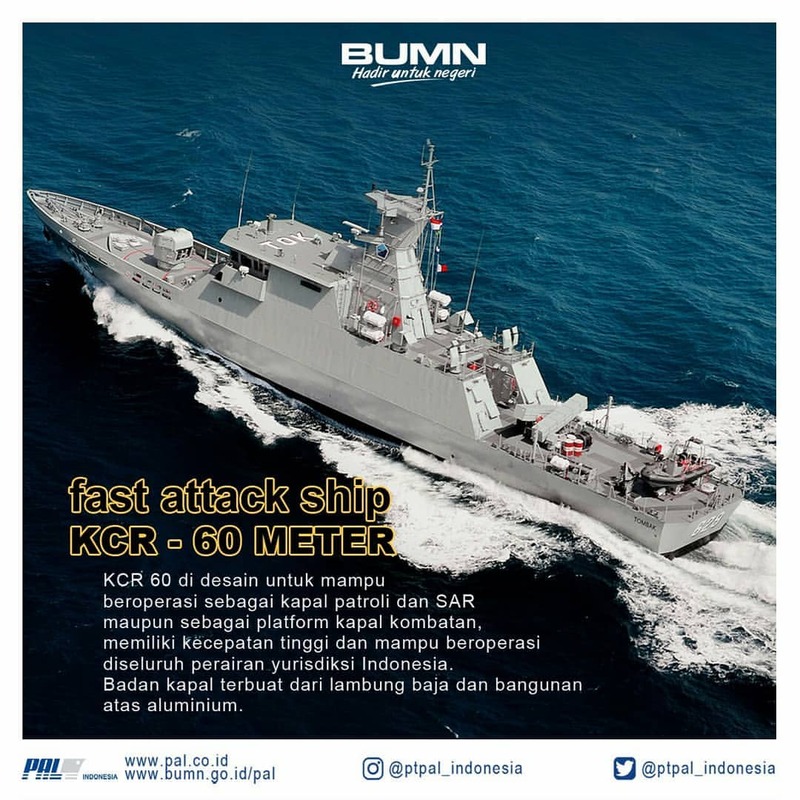 Merdeka.com - Kementerian pertahanan (Kemhan) dan PT PAL Indonesia menandatangani kontrak kerja kapal cepat rudal (KCR) 60 meter yang ke-5 dan 6. Kapal canggih ini akan langsung dibangun lengkap dengan persenjataannya. Sekretaris Jenderal Kemenhan, Laksamana Muda TNI Agus Setiadji di Surabaya, Senin, mengatakan kontrak pembangunan KCR ke-5 dan 6 ini dilakukan secara komplet, atau langsung dilengkapi dengan persenjataan canggih, salah satunya rudal. "Selama ini ada dikotomi bahwa kontrak kerja KCR dengan PAL Indonesia dilakukan secara bertahap, tidak komplet. Seperti pembuatan terdahulu, kemudian menyusul persenjataannya," kata Agus, ditemui di Kantor PT PAL Surabaya. Namun, kata Agus, pada pembuatan ke 5 dan 6 dilakukan secara fungsi asasi, yakni berfungsi langsung sebagai kapal perang dengan peralatan persenjataan komplet dan keberadaan sistem Sensor, Weapon, and Command (Sewaco) yang menyertainya. "Untuk nilai kontrak satu kapal sekitar Rp 1,66 triliun, atau lebih murah dibandingkan dengan memesan kapal serupa di Eropa dan Korea Selatan. Namun demikian, tetap mempunyai kualitas bagus sesuai dengan kondisi iklim tropis Indonesia," katanya. Terkait target, Agus menyebutkan penyelesaian pengerjaan KCR 5 dan 6 ditarget 24 bulan, karena ada beberapa komponen peralatan yang dipesan membutuhkan waktu di atas 14 bulan, seperti motor pokok kapal. Ia berharap, dengan adanya seremonial penandatangan kontrak kerja beberapa pihak BUMN dan vendor yang dilibatkan bertanggungjawab sesuai dengan keinginan pembeli dan komitmen tepat waktu, tepat mutu, terjadwal sesuai komposisi yang diinginkan. Direktur PT PAL Indonesia, Budiman Saleh mengatakan pembuatan KCR pesanan Kemenhan ke 5 dan 6 ini sepenuhnya memanfaatkan industri lokal yang telah terdaftar sebagai industri pertahanan di Tanah Air, yakni sebanyak 62 BUMS. Selain itu, kata dia, juga didukung empat Badan Usaha Milik Negara (BUMN) dalam proses pengerjaannya, seperti PT Pindad, PT Barata Indonesia, Krakatau Steel, dan PT Len Industri. Terkait dengan Tingkat Kandungan Dalam Negeri (TKDN), Budiman mengatakan KCR ke 5 dan 6 ini lebih tinggi dibanding sebelumnya, yakni sejalan dengan pemenuhan Kekuatan Pokok Minimum (Minimum Essential Force/MEF) Kementerian Pertahanan pada Tahun Anggaran 2015-2019 sebesar 19,56 persen. KCR 60 meter ini merupakan hasil inovasi yang dikembangkan dari produk sebelumnya yaitu Kapal Patroli Cepat 57 Meter. Desain pembangunan KCR 60 meter disempurnakan mereferensi dari masukan dan arahan Satuan Tugas (Satgas) serta pengguna produk. Pangadaan Kapal Kombatan ini dalam rangka pemenuhan MEF sebagai tindak lanjut implementasi Undang-Undang Nomor 16 Tahun 2012. Pembangunan KCR 5 dan 6 juga turut melibatkan 3 pemasok persenjataan kelas dunia (Bofors-Swedia, MBDAPerancis, Terma-Denmark) yang sesuai dengan kebutuhan operasional TNI AL. 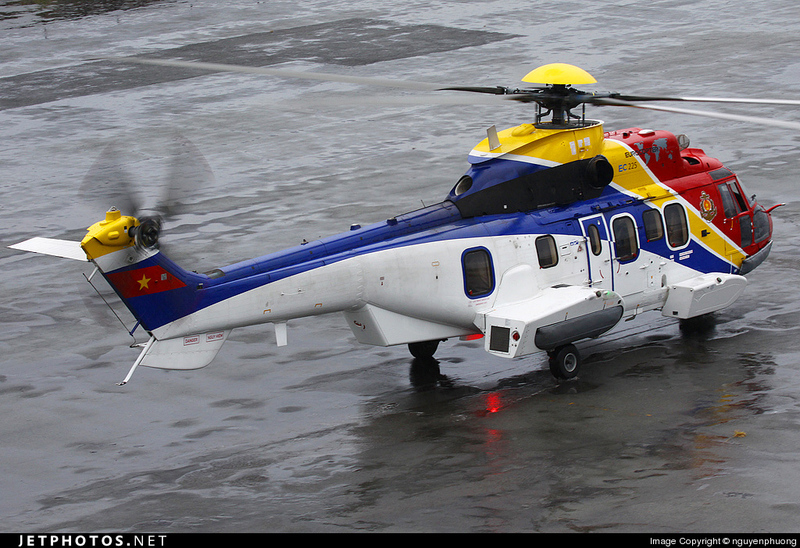 Where is the Vietnam Navy Air Force Pilot Trained? 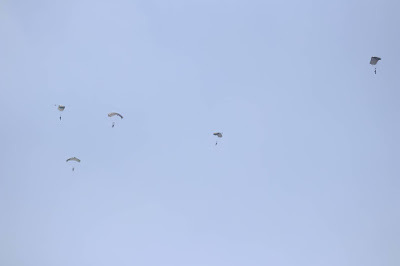 The Naval Military Representative said there is no private training school for the Naval Air Force because this is a special field, it will be very difficult and expensive to train separately. Talking to reporter Tien Phong , Rear Admiral Pham Van Luyen, Vice Chairman of the Political Army Navy, said the Navy Air Force was a new force of the Vietnamese People's Navy, with the takeover of the Brigade Air Force 954 from Air Defense - Air Force. According to Rear Admiral Pham Van Luyen, the Brigade only had a Russian line of Ka-28 underground aircraft when it was transferred to the Navy. Then, with the project of modernizing and developing forces of the Naval Air Force, the Army reported to the Ministry of Defense and the State equipped two new types, the Canadian DHC-6 seaplane and EC-225 multipurpose transport helicopter bought by France. 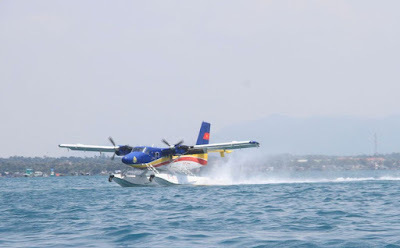 Currently, the Navy Air Force pilots, especially pilots controlling DHC-6 and EC-225, are trained from two domestic sources (Air Force Officers School) and foreign to visit. update knowledge and skills to meet the needs of mastering new equipment. Speaking of the selection of Navy pilots, Rear Admiral Pham Van Luyen said there is currently no private training school for the Navy Air Force but still thanks to the Air Defense - Air Force because this is the field. In particular, it is very difficult and expensive to train separately. 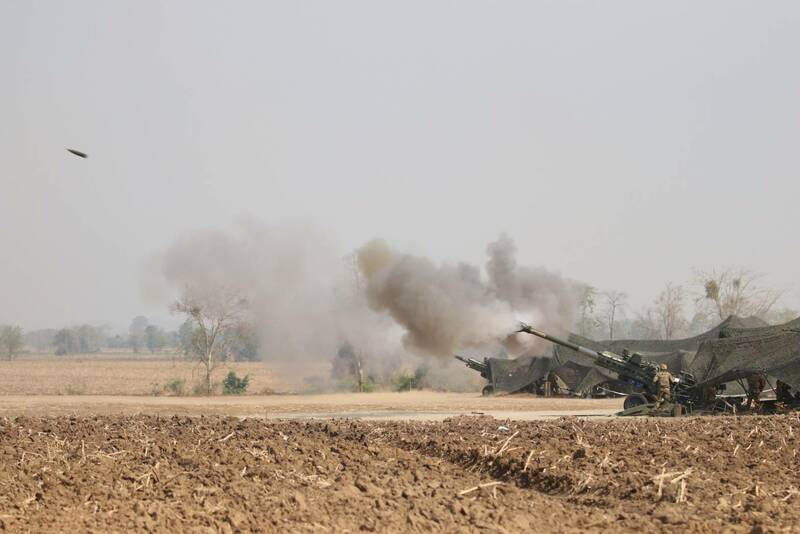 "In the past, Brigade 954 closed a dispersed army in three places, Da Nang, Cam Ranh and Vung Tau, now has been concentrated in one place to create favorable conditions for the operation and commanding," Vice-President Politics of the Navy Army said. In 2013, the 954 Air Force Brigade was handed over to the Navy Army as decided by the Minister of Defense. Previously, the Minister of Defense also signed a decision to reorganize the 954 Air Force Regiment to 954 Air Force Brigade. 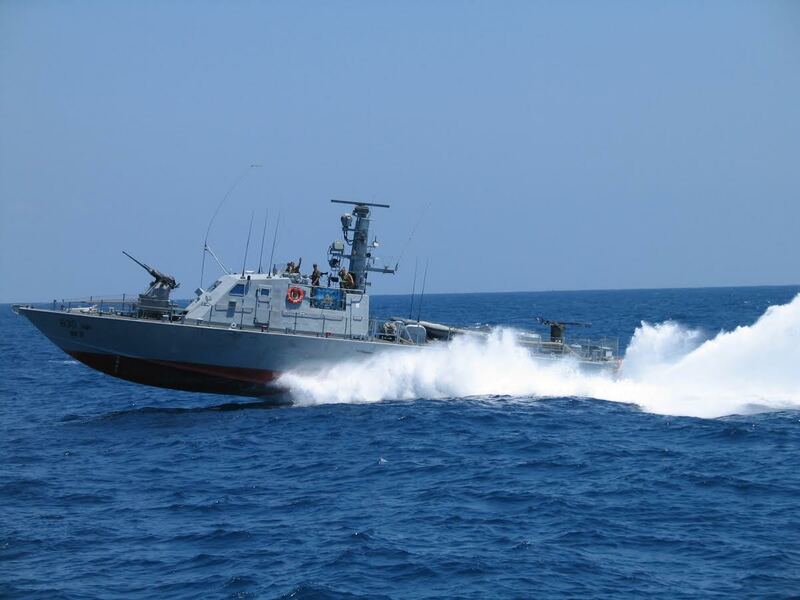 The 954 Naval Air Brigade can perform submarine hunting missions; military transport; reconnaissance, observation on the air, on the ground, on the water; Search and rescue at sea, on land and rescue, rescue and flood prevention. 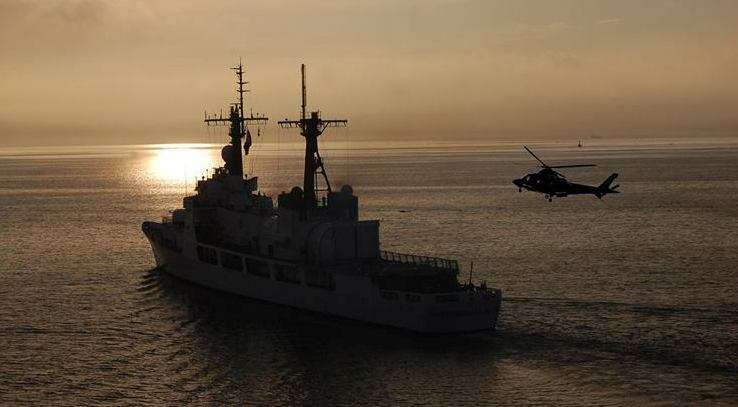 MANILA -- The proposed upgrades planned for the Philippine Navy’s (PN) Del Pilar-class frigates will greatly boost the ships' electronic capabilities, making it more capable of patrolling and conducting inter-agency operations in the country's territorial waters. "The 'Del Pilar Class Frigate Upgrade' will enhance the ships' management system, electronic support and sonar capability, ensuring top performance during maritime patrols, search-and-rescue, and other inter-agency operations in our territorial waters," Department of National Defense (DND) spokesperson Arsenio Andolong said in a message to the Philippine News Agency (PNA) over the weekend, when asked to comment on the more than PHP1.5-billion upgrade for these ships. Earlier, the DND Bids and Awards Committee 1, in the defense department's website, announced that it is starting the procurement for the "Del Pilar Class Frigate Upgrade Acquisition Project" of the PN. "It does not look like the Navy intends to install additional weapons systems on the Del Pilar Class ships because only their sensors are being upgraded. 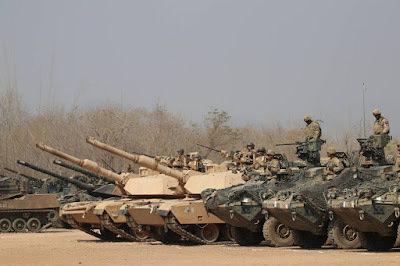 At the moment, the advanced weapons are only being considered for the brand-new platforms that we are acquiring," he said. It has a cruising range of 14,000 miles, a sea and loiter time of 45 days, and is armed with a 76-mm. Oto Melara automatic cannon, 25-mm. and 20-mm. light cannons and .50-caliber machine guns. 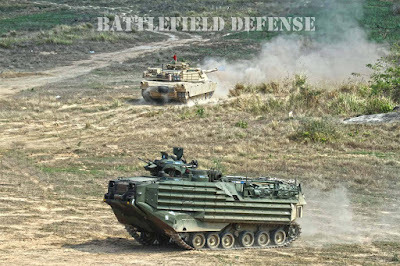 Mounted on a forward observer vehicle, Rheinmetall Group’s state-of-the-art Vingtaqs II reconnaissance and surveillance system accurately determines target coordinates at long ranges. Rheinmetall’s state-of-the-art Vingtaqs II has been successfully put to the test in missions of a number of the world’s armed forces. Australia has recently opted to buy the system as well. Under the country’s Land 400 Phase 2 procurement programme, 29 out of a total of 211 Boxer wheeled armoured vehicles will be configured for a Surveillance/Joint Fire role, equipped with this high-performance sensor suite. The subcontract represents an important order for Rheinmetall Norway AS. How does Pakistan’s Thunder Fare Against Contenders in Malaysia’s aircraft Competition? ISLAMABAD — Pakistan hopes to sell its JF-17 Thunder aircraft to Malaysia, now that the cash-strapped country is officially looking for such a fighter. 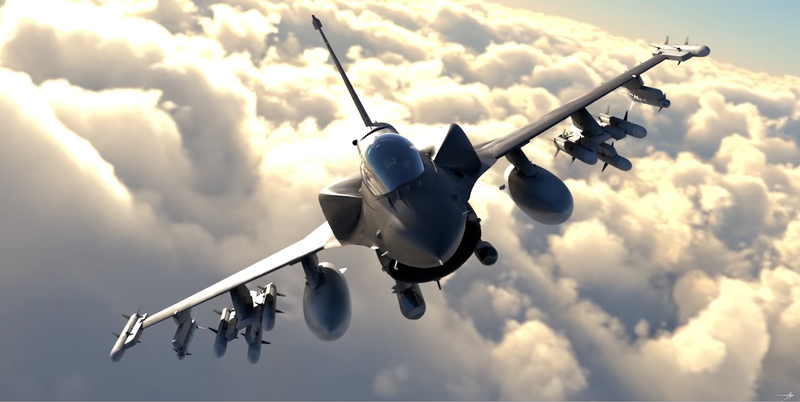 Malaysia was eyeing larger fighters like the Rafale and Typhoon, but that plan was shelved due to budgetary woes, and the country instead turned to fulfill a light combat aircraft requirement. An LCA fleet would support Malaysia’s F/A-18 and Su-30 fighters. 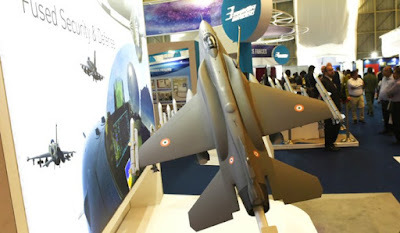 The JF-17 is under consideration alongside the Tejas, produced by India’s Hindustan Aeronautics Limited, and the FA-50 Golden Eagle, made by South Korea’s Korea Aerospace Industries. Pakistan’s offering is the most affordable of the three. 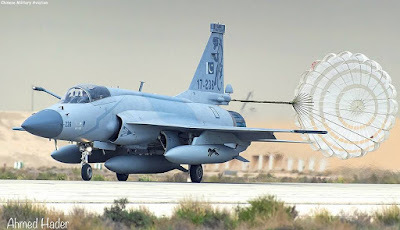 Defense News reported in 2015 that Malaysia was considering the JF-17 as an option for its Air Force modernization program, as signaled by its high commissioner to Pakistan, according to the Associated Press of Pakistan. But Malaysia’s defense minister at the time denied the report. 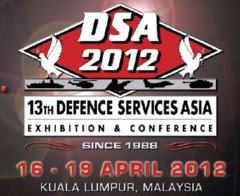 Pakistan renewed efforts last year, most notably at April’s DSA defense expo in Malaysia and November’s IDEAS defense conference in Pakistan. Pakistan is offering the latest Block III variant. The 2021-2022 LCA program delivery time frame means a Malaysian order could include some of the first fighters off the production line, with potential industrial offsets. 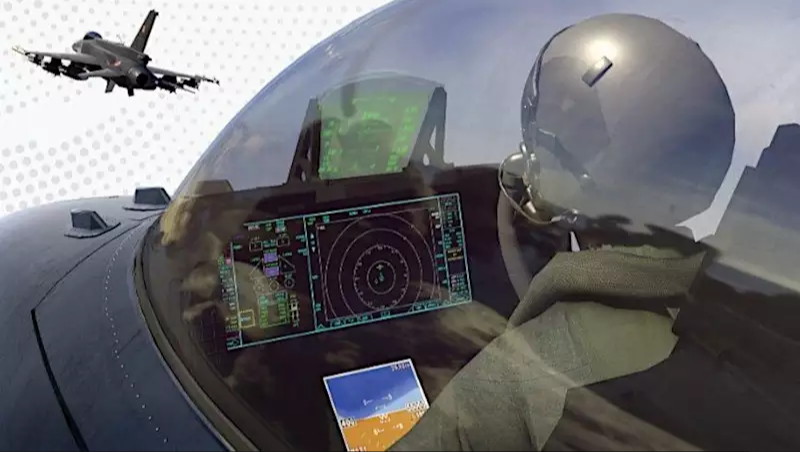 Analyst and former Pakistan Air Force pilot Kaiser Tufail says the Block III “is quite promising" with an active electronically scanned array radar, helmet-mounted display and sight, electronic countermeasures, and an additional underbelly intake sensor station. "On cost grounds, the JF-17 has a square chance,” he said. The JF-17 costs $25 million per unit, and the Tejas and the FA-50 cost approximately $28 million and $30 million respectively. An order of 36 JF-17 fighters would mean “a very substantial amount will be saved,” Ho said. 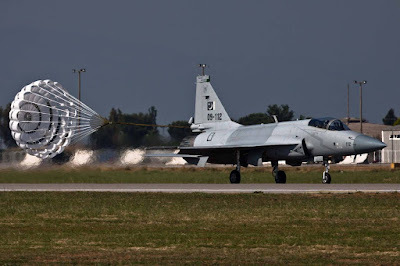 However, the JF-17’s Russian engine may be problematic, as due to serviceability issues with the related engine of Malaysia’s MiG-29s, potentially requiring “significant after-sales support and maintenance,” Ho added. The Tejas is powered by the same General Electric F404 engine used in Malaysia’s F/A-18s, and shares weaponry with the Su-30s. However, the Tejas’ Israeli avionics would likely need replaced, which “invariably means additional costs,” he noted. While the FA-50 is the “costliest prima facie,” it is also powered by the F404, shares weaponry used by the F/A-18, may have “lower downstream costs” and is in service regionally, allowing “interoperability between its major regional counterparts during exercises and operations,” he added. TRIBUNNEWS.COM, THAILAND - Asops Panglima TNI Mayjen TNI Ganip Warsito, S.E., M.M., meninjau The Combined Arm Live Fire Exercise (Calfex) sebagai bagian dari Latihan Cobra Gold 2019 yang melibatkan 29 negara peserta, termasuk Indonesia yang dilaksanakan di the 3rd Army Area Tactical Training Center, Shukotai-Thailand, Jumat (22/2/2019). 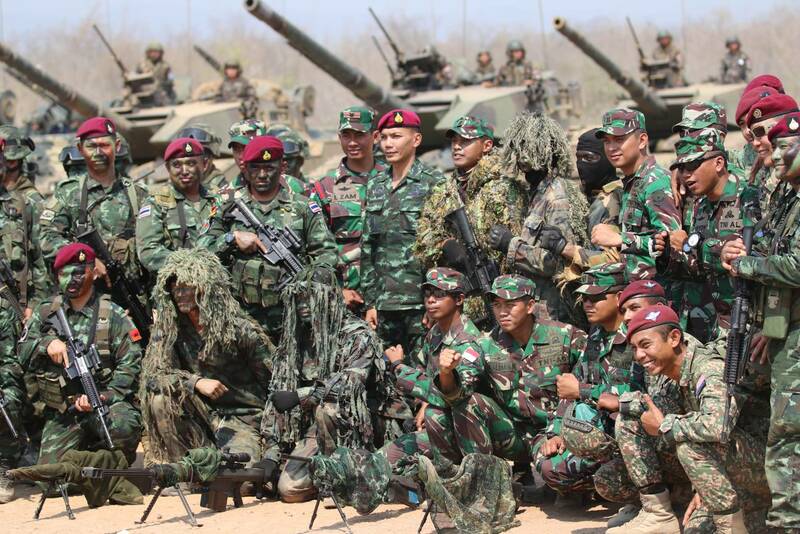 Kehadiran Asops Panglima TNI Mayjen TNI Ganip Warsito di Thailand atas undangan Panglima Angkatan Bersenjata Thailand, Jenderal Pornpipaat Benyasri untuk menyaksikan secara langsung jalannya latihan bersama dengan para pejabat Angkatan Bersenjata antara lain Korea Selatan, Singapura, Jepang, dan Malaysia. BENGALURU: To shake off the Pakistan tag that has throttled its efforts to pitch the F-16 to India, US aircraft maker Lockheed Martin is willing to recast and rebrand its old warhorse as F-21, just for India. The new fighter jet may still be on the drawing board, but Lockheed officials claimed that it was a “completely different” plane, tailored specifically for the Indian Air Force. They also indicated that it could have certain technologies from the F-22 and F-35. Incidentally, the fifth generation F-22 is made specifically for the US Air Force and not sold to any other country. The F-21, which Lockheed will make with Tata Advanced Systems, will be on offer for bid on India’s requirement of 110 combat aircraft. 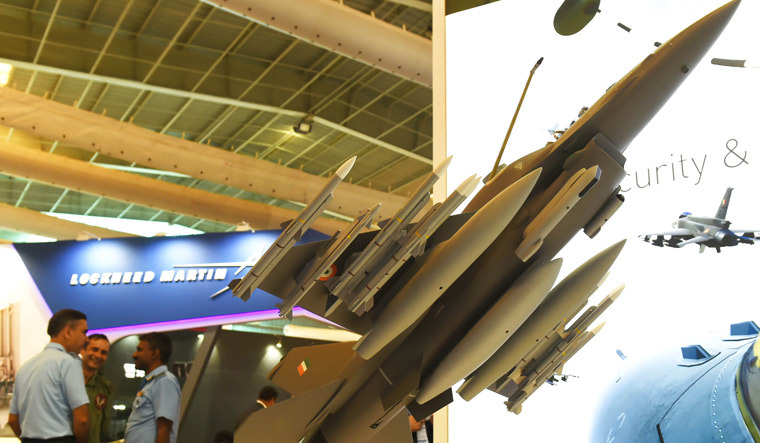 “The F-21 addresses the Indian Air Force’s unique requirements and integrates India into the world’s largest fighter aircraft ecosystem with the world’s preeminent defence company. Lockheed Martin and Tata Advanced Systems would produce the F-21 in India, for India,” a statement by the company read. 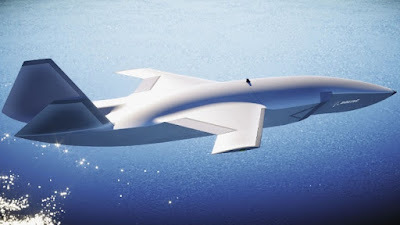 When asked by ET, Lockheed officials said that there were visible changes in the aircraft, including a new ‘spine’ that is designed to provide more space to get future systems into the jet. The change that has been done is likely to counter the argument that the F-16 had been rejected by the Air Force in the earlier Medium Multi-Role Combat Aircraft contest on the grounds that the air frame is not capable of integrating future capability expansions. Though Lockheed has promised that technologies developed from the F-35 and F-22 fighter jets will be integrated into the F-21 on offer, it’s unlikely that the fighter jet will take off unless India selects it. The India-specific enhancements will also happen at a heavy cost that would have to be integrated into the larger project.